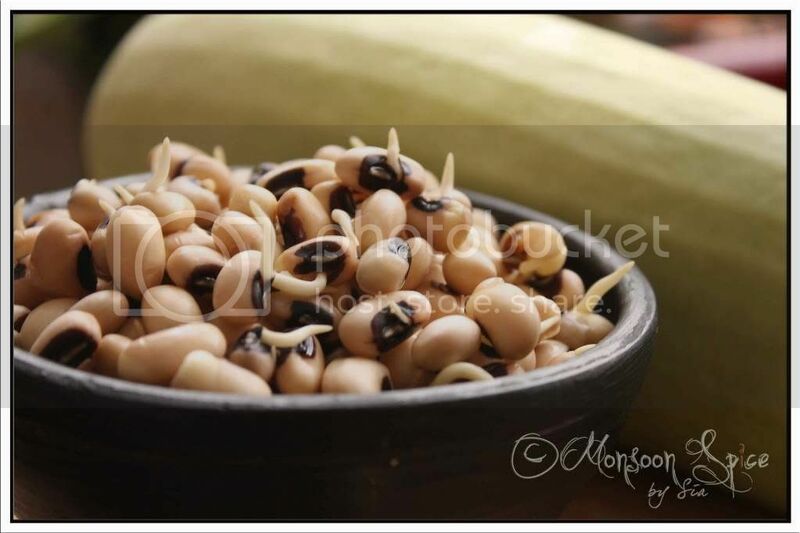 Monsoon Spice | Unveil the Magic of Spices...: Lauki-Lobia Curry: Fascinating Sprouts! Regular readers of my blog will know my love for Black eyed peas. Last week while washing the beans for another batch of Chavli Amti, I suddenly thought of sprouting them and using it in curries. I am among those people who can’t rest until they finish the job that they set in their mind. While the beans were sprouting nicely, I couldn’t help but compare them to the whole process of Life-Death-Life after death! Sounds silly or crazy or both? Didn’t I warn you in the beginning itself? But think about it, all these beans and lentils usually go though two transformations. First one is when they are young and fresh. All those bouncy and fresh ones jumping and running around with high energy. That’s their first life as child, adolescent and grown-up. And then there is a dried bean, all hard and tough skinned, as if it is dead and can’t feel anything that happens to it. When you soak this same bean in water, it re-hydrates and as a result it’s all round and plumps up. Take these same beans and sprout them and what you see is another life formation! Plant these sprouts in soil and with in few days you will see small plants sprouting and growing and producing new batch of crops. Isn’t it a fascinating process? Give it a thought sometimes and you will know why I said life fascinates me :) Now, do you see the connection between my theory and the theory of Life-Death-Life after Death? If not, just forget it and jump to the recipe part. There is no denying the fact that all Beans, Lentils or Legumes are good for us as they are. But sprout the same and they become one hot favourite thing to cook and eat at our household. Last week, I sprouted a cup of dried black-eyed peas and cooked this delicious Lauki-Lobia Curry. I chose bottle gourd because it easily absorbs all the flavours and doesn’t over powder the nutty taste of black eyed bean sprouts. But if you are not too fond of bottle gourd, simply substitute it with potatoes or any other veggies of your choice and enjoy its goodness. 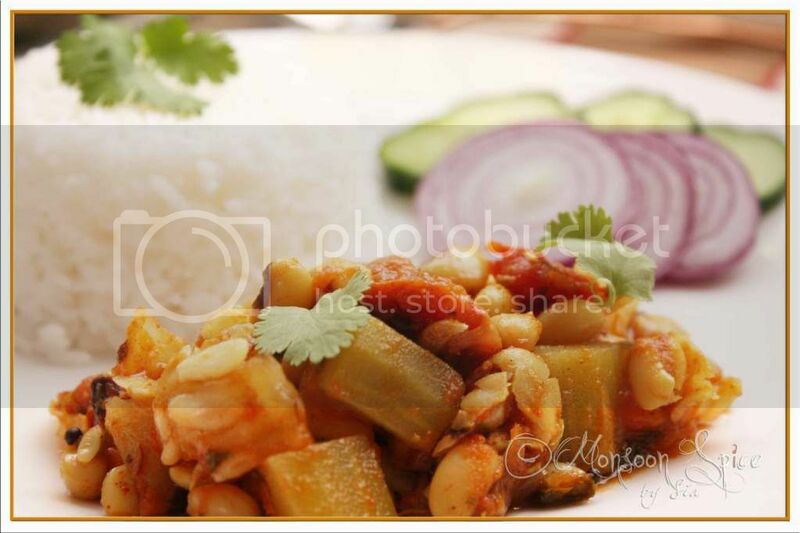 Cooked with very few ingredients, this Lauki-Lobia Curry is one delightful side dish with steam cooked rice or roties. And not to forget the fact that this Lauki-Lobia Curry is packed with nutrition and flavour! Lauki-Lobia Curry is my contribution for this month's My Legume Love Affair- Ninth Helping hosted by Laurie of Mediterranean Cooking in Alaska. MLLA is a lovely event strated by dear Susan of the wonderful blog The Well Seasoned Cook. Cook black eyed bean sprouts in a pressure cooker or on stove top till it turns tender. The beans should retain their shape and make sure that you don’t over cook it. Drain water (that can be used in making dough for chapatti/roti as it has high nutritional content) and keep it aside till needed. Heat oil in a pan and add mustard seeds to it. When mustard starts to pop and splutter, add cumin seeds, hing and curry leaves. Saute till cumin turns golden red in colour. Mix in finely chopped onion and sauté till it turn golden red, about 3-4 mins. Add chopped tomatoes and cook till it turns pulpy and releases its juice, about 4-5 mins. Now add all the spice powders (cumin-coriander, turmeric, chilli, garam masala and dry mango powder) along with jaggery, salt to taste and ½ cup of water. Bring the whole mixture to gentle boil and add cubed bottle gourds to it. Cook covered till bottle gourd is tender, about 5-7 minutes, stirring in between to make sure that the curry doesn’t stick to the pan. Mix in cooked bean sprouts and adjust the seasonings. Add little more water if needed and cook uncovered for another 5 minutes till the bottle gourd is cooked thoroughly and all the flavours blend well. Garnish with finely chopped coriander leaves and serve this delicious Lauki-Lobia Curry with Roti or Rice and enjoy. Not too fond of bottle gourds? Simply substitute bottle gourd with potatoes and enjoy this curry. Similarly you can chose not to sprout the black eyed peas and go ahead and cook this curry. Or use any other sprouted beans and enjoy this flavoursome curry. You can also replace Garam Masala with any other curry powder (Sambar, Aamti etc). I have never sprouted beans and this recipe will give me a reason to do so. Love the tip yu gave about using potaoes as here we don't get bottle gourd. your dish looks very nice sia. Again and again you are making me to fall in love with your pictures...Lovely ones..OMG, I have no words to say...Out of the world!!! LOVED the pic of sprouted beans! Lobia and lauki sounds like a great combi, Sup! i never tried lobia b4..but combo with lauki sounds awesome.. I have never cooked with lauki before must try out this recipe! Wow... this looks absolutely delicious! Nice recipe! Nice click! Congratulations on the great work you're doing here, you got a big fan in Mexico! Now, I've never seen black eyed peas here, they're either pretty hard to find or unavailable. U made me crazy Sia wih these post! Is it wild thinking? or philosophy? A different curry should be great with roti! Liked that u sprouted them. We had lobia yesterday.. but i made a spicy dal with all the other dals.. Lauki is something which i make with a lentil most of the time. now i am going to soak some lobias for they look really yummy just like that! U r simply great..!!! just today i was searching for some 'Black eye peas' recipe.. got it immediately.. thank u..Sia..
That is one wonderful, healthy recipe....I must try and sprout some over the summer...no such luck at the moment when its still cold....thanks for a great idea, Sia. Very nice comparision of life with sprouts. One of many quirks of my husband is that he doesn't eat sprouts. You know why? because he feels that we are taking away it's life. If we plant the sprouts it will grow up to be a plant, is his thought. The picture is really very good Sia. Have sent you a mail. Recently I posted a chocolate cake using bottle gourd. Lauki and Lobia what a perfect combination, right. I love the way you sprouted them, dear. Yumm. Picture looks great too. I usually prepare lobia plain or with potatoes, vada's and sometimes dosa. never tried with with lauki. sounds delicious. With sprouted beans - I learn something new everyday:) It is almost lunch time here and I am hungry for this! 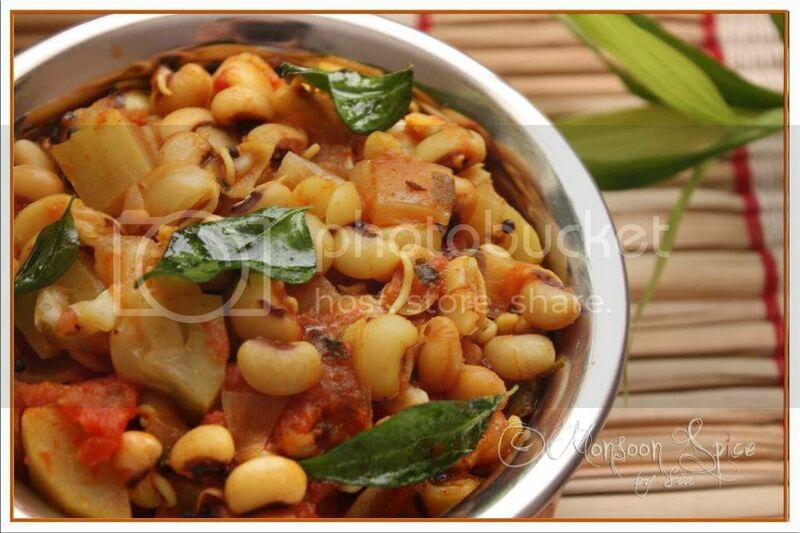 I have quite a thing too for black-eyed peas, and I can quite understand why you feel like waxing eloquent about them :) I have some bottle gourd sitting in my fridge right now, so this curry's something I'd like to try very soon. Wow healthy and delicious combo..Nice idea of using sprouted beans. that's an interesting analogy you drew with the sprouts, hmmm..u got me thinking too. I love sprouts too. Haven't tried sprouting the alasande kalu though. Curry looks really good. Sia, the pics are great! Never tried this version. I always cook them with grated coconut. Thanks for such a simple recipe. I have never been to your blog but am adding this to my favorites now. Happy Ugadi to you. I know what I am cooking next. Your lauki-lobia curry. Thanks for the creative combo. 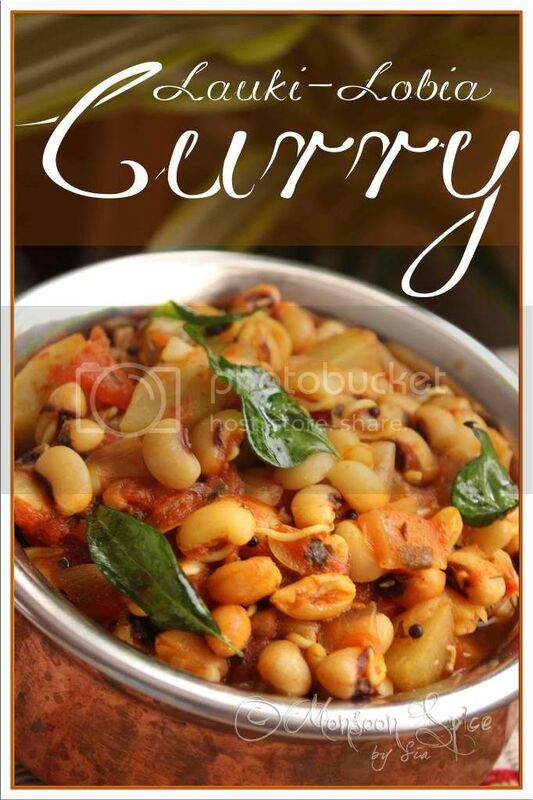 The curry looks so delicous and easy to prepare! I like this lauki-lobia curry recipe. these lauki-lobia curry are sure to taste great and are extremely nutritious as well. I am going to make it for the holidays when my kids will be at home. I'll be sure that what they are eating is healthy. thank you for shearing your post. 1. When you say medium bottle gourd, what would it's weight be? Or, how many cups of 1/2 inch cubes? 2. Do we keep the bottle gourd seeds in the cubes or do we discard them? 3. Salt - I know it is to taste - but how much would you put? 4. Does sprouting enhance flovour? Or is that a health thing? 5. If I have to cook lobia on stove, how much watr do I add for 1 cup lobia? 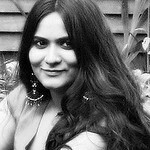 @Aseem Saxena, By default I think and post for readers who have basic knowledge of cooking and technical ability of understanding the way the ingredients work :) May be I shouldn't make such an assumption. So thank u for leaving a note. Now let me answer to ur query. 2. if the bottle gourd is really tender and seeds are tiny and tender to bite, then keep them as it is high is fibre. If not, just core the bottle gourd and discard the seeds. 3. I usually use less salt in cooking. So for this recipe I would have used around ¾ to 1 tsp salt. Always begin with less salt and add it later as per your taste. 4. I always find the sprouted beans much tastier. Again, it is optional and u can use them straight away if you are limited by time as it takes at least 2 days for the sprouting. And also sprouts cook faster than whole beans/legumes. 5. I follow basic ratio of 1:2.5 of beans to water when cooking in pressure cooker. You can use 1:2 of beans to water on stove top and increase the amount of water as and when needed. Make sure that there is enough water to cover the beans completely. Bhindi Do Pyaza: Say No to Slimy Okra! Dahiwale Baingan: Less is More! Poolish Focaccia: My Story about... "Doing It"!